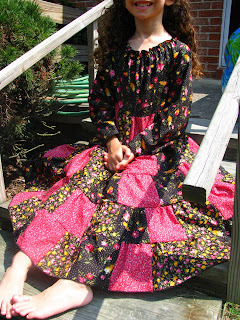 Now this one has twirl factor, not to mention the unlimited fabric color/pattern choices. My daughter thinks more is better on the number of fabrics to include in this one...I happen to agree. The Patchwork Quilt Dress/shirt pattern is designed to be easy to fit and easy to assemble, yet stylish. With just one pattern piece, and some cutting, you can make a a beautiful dress for your little girl. The pattern includes sizes 6 mo. - size 10. The size pertains mostly to the width of the dress, as you have full control over the length. So if you have a tall and thin daugther, a size 10 may fit eventhough she wears a larger ready-to-wear size for length. Add a pair of bloomers for your little one, or for older girls, make the dress a bit shorter (tunic) and pair it with the Cute and Quick Pants or capris, also designed by SquigglyTwigs to change it up a bit. You have control of the bottom width and length. So make it as full, or as long, as you please, by adding or subtracting squares and tiers. This dress looks best with a variety of fabrics. I used just three fabrics in the dress in the picture. It looks ok, but we prefer the look in the Quilt Jumper, which has many more fabrics in it. I would suggest 5 or more. We now save any fabric scrap big enough for at least one 5" square. Not only will these scaps make beautiful dresses, but hold wonderful memories of other projects as well. This video will help you with chain piecing your squares for the dress.